« Asiaviews republishes Sacred Skin review! 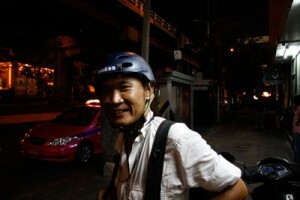 Check out the excellent photo essay Risky Bangkok by seminal Thai photographer Vinai Dithajohn. Vinai Dithajohn is a Bangkok-based photojournalist covering news and documentary stories in Thailand and Southeast Asia for the past ten years. He has been shooting Thailand’s political turmoil as well as Bangkok’s dark underbelly and subcultures, often risking his life to bring us these excellent and stark images of realities few visitors to the Thai capital ever get to see. I especially like this photo essay he has posted on YouTube.